From left are judge Emma Lou Martin and Best in Show winner Patty Cunningham. The 57th annual Labor Day Show exhibit will continue through Saturday, September 8, at the RAL Art Center, 19 North Main Street, Kilmarnock. This show features paintings, photographs, sculpture, stained glass, clay, fiber and jewelry. A First Friday Reception is scheduled from 5 to 7 p.m. September 7, said chairman Patty Richards. The public is invited to view the award-winning art and meet some of the artists. An awards ceremony was held for participating artists on Friday, August 31. Ron Mihills served as master of ceremonies. President Harold Burnley conducted a visual presentation of the winners. Emma Lou Martin of Richmond judged the 120-piece show. 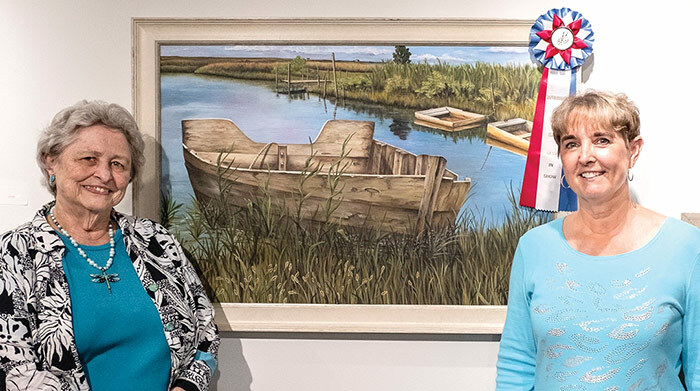 Best in Show was awarded to “Up the Creek at Tangier Island” by Patty Cunningham. This perfectly executed acrylic had it all…perfect perspective, great values, superb color mixes and an odd number of subjects interestingly arranged, said Martin. Five Memorial Awards were given in honor of past artists and a past executive board member. • Marianne Miller, photograph, untitled.